I spent two weeks discussing the infrastructures for network services & contents in Gegerkalong Campus, the Learning Centre of Telkom. On the last day, almost without break, I had to fly to Surabaya for preparing a seminar. This seminar is a part of the seminar series Opening The Gates to 4G Mobile Technology that we have carried out in Jakarta, Bandung, and Yogyakarta. In Surabaya, the seminar is hosted by Universitas Pelita Harapan (UPH Surabaya). 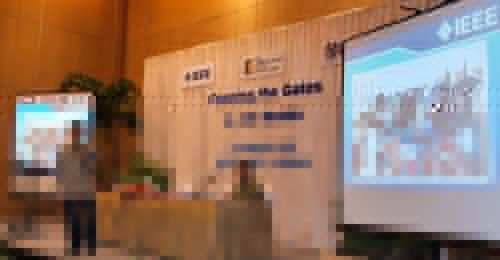 It was held at Hotel Mercure Surabaya on 20 February 2009. Muhammad Ary Murti: Introduction to the IEEE, societies, Indonesia section, chapters, membership. Participants came from UPH Surabaya and other campuses around Surabaya, as well as some professionals who study the field of mobile telecommunications. And just like the way I came — i.e. with almost no break — I also had to leave Surabaya the same way. Signed the certificates, and run for the flight under a heavy rain under Surabaya sky. But I was delighted — it was a very successful seminar. Thank you, UPH Surabaya :).